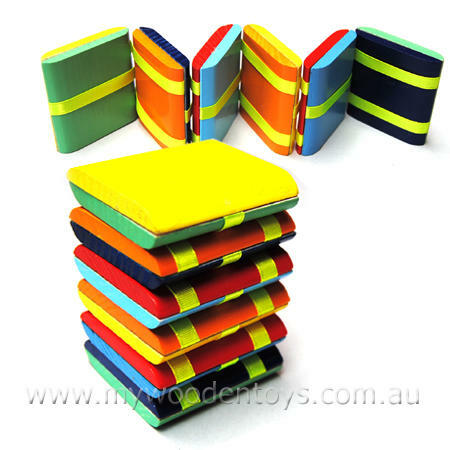 Jacobs Ladder Wooden Illusion Toy is a one of the most ancient and famous of folk toys. Legend has it that one was found in King Tut's tomb, which means these fascinating toys were played with in Egypt before 1352 B.C. When it is being used it looks as if the blocks are falling through each other from top to bottom. To work the toy you hold the top block by the edges and flip to touch the second block the blocks then appear to cascade downwards....Fantastic! Size: 9.5cm x 5cm folded and 32cm extended. We like this because: "It is so colourful and fasinating. Even when I take it to pieces I cant work out how the illusion is created."